What about new IQ merchandise gems? I don't know the english word, in germany we call it "Bierdeckel" or "Untersetzer". My beers and colas are tasting much better when using this. Superb is, that she created a new IQ logo to bring the wake logo to a round form. Perhaps it would be a good idea to print it on the next CD? Cool Beerdeckel & great logo design too! 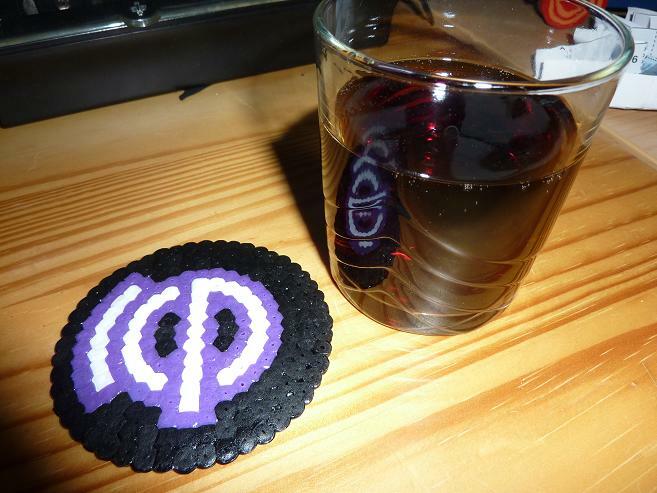 Coaster... yeah! Thanks! On the other hand, when you're filled with wanderlust and you're on the way to to fetch your wunderkind from the kindergarden with your rucksack on, feeling that angst creeping up inside you that somewhere a doppelganger or a poltergeist might be around, a beerdeckel (or beerdackle?) wouldn't be so terribly out of place, would it? bokkers wrote: Coaster... yeah! Thanks! On the other hand, when you're filled with wanderlust and you're on the way to to fetch your wunderkind from the kindergarden with your rucksack on, feeling that angst creeping up inside you that somewhere a doppelganger or a poltergeist might be around, a beerdeckel (or beerdackle?) wouldn't be so terribly out of place, would it?